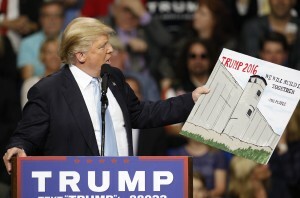 WASHINGTON — Congressional Republicans and Donald Trump’s transition team are exploring whether they can make good on Trump’s promise of a wall on the U.S.-Mexico border without passing new legislation, officials said Thursday. Under the evolving plan, the Trump administration would rely on existing legislation authorizing fencing and other technology along the southern border. Congress would be asked to ensure that enough money is appropriated to take additional new steps — but would not pass a stand-alone bill authorizing a big new wall. The potential approach was confirmed by two congressional officials and a senior transition official with knowledge of the discussions; all spoke on condition of anonymity because they were not authorized to discuss the matter publicly. Details were scarce and the officials emphasized that no final decisions had been made. The approach could come as a surprise to some but could avoid a legislative fight Trump might lose if he tried to get Congress to pass a stand-alone bill authorizing the kind of border wall he promised during the campaign. It’s not clear how much could be done along the 2,000-mile border without additional actions by Congress. Lawmakers passed the Secure Fence Act of 2006, but most of those 700 miles have already been built, although some areas are in much better shape than others. But whatever steps might be taken without Congress’ approval would be likely to fall short of the extravagant new wall on the border that Trump repeatedly said Mexico would pay for. And despite Congress’ involvement in approving any spending, such an approach might also open Trump to charges of going around the House and the Senate to take unilateral actions, something he repeatedly criticized President Barack Obama for doing. Several lawmakers and congressional officials said the administration could have significant flexibility in taking additional steps without Congress’ approval. However, some immigration hard-liners have already expressed the desire to see Congress take a vote given how prominent the wall was during Trump’s presidential campaign, and their desire to act on the issue.